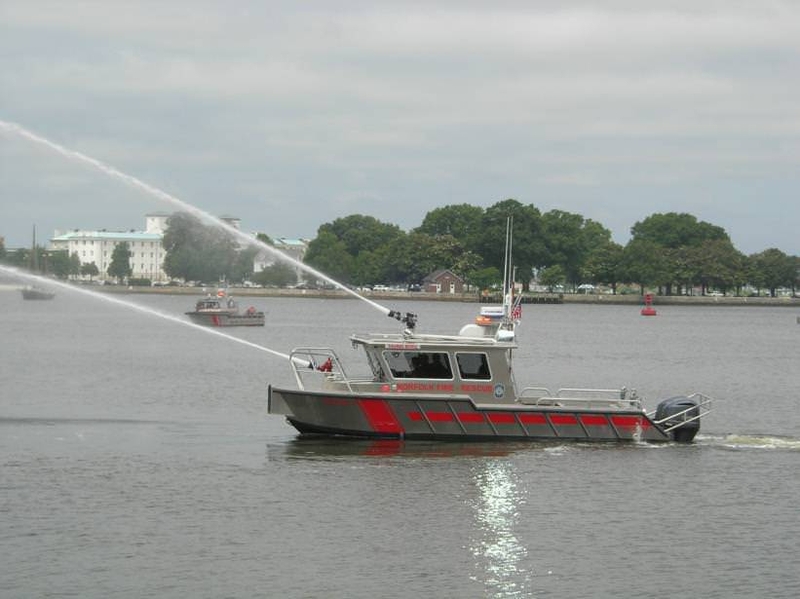 The Thomas Kevill, MetalCraft Marine Firebrand 30 for Norfolk, VA Fire-Rescue. 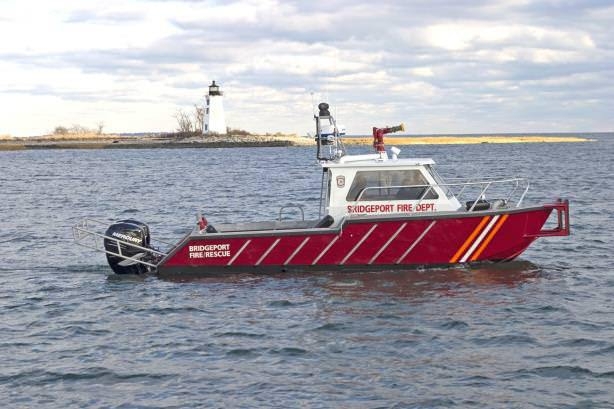 MetalCraft Marine Firebrand 28 for Bridgeport CT.
Based on a fire truck design, the Firebrand 28/30 offers ease of maintenance and repairability. Simplicity is the key to this fire system. The FB-28/30 packs a huge punch for its relatively small size, and can get into the smallest of marinas. The Firebrand 30 is based upon the Firebrand 28, but stretched to provide alternate equipment and cabin layouts. 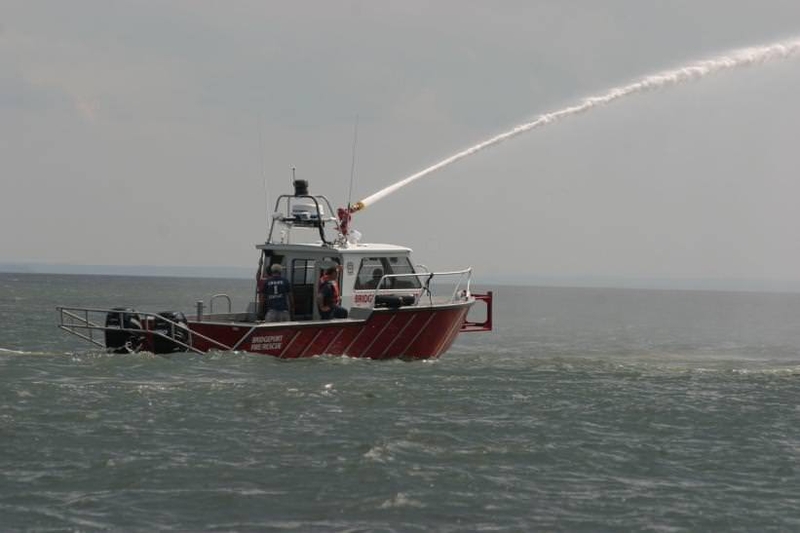 The Firebrand 28/30 is a new generation of fireboat that provides more speed, maneuverability and pumping capacity than any other boat in its class. This is highest pumping 28' N.F.P.A. 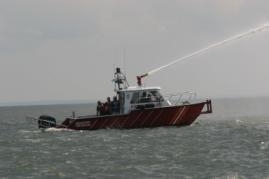 fireboat in North America. Fitted with a Darley 1250 GPM pump, the FB-28 is able to produce flow meter results of 1500 GPM due to a unique MetalCraft Marine proprietary designed sea chest. Our sea chest has an intake of three times the cross sectional area of the main. It can also be inspected, cleaned and provide a positive head to the pump while underway. The monitor, located close to the boat's center of buoyancy, permits the helmsman to pivot the boat around the thrust load at low RPM, similar to the load of a towboat. Operators are amazed at the boats' control under full steaming at any angle. The boats head never blows off its course. Electronics  VHF  GPS, chartplotter w/depth  Compass  Loudhailer/Fog horn  Siren  Emergency lights  Many available options FLIR etc. 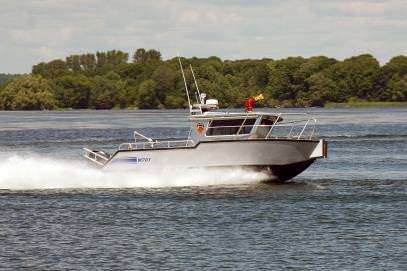 Other Features  Chart Table  Crew seat  Non skid 18' side decks  Safety railings with harness brackets  Anchor Locker  Hinged Dive Door  3 watertight compartments  Rubber sound matting  3" 'D' rubber fendering  Fully finished interior  Flat or treadplate aluminum decking  Tinted side windows, clear windshields  2 speed wipers  40,000 BTU cabin heater w/defrost  Hinged mast w/ radar arch  Push knees  Access to all piping and valves  All piping concealed  Deck hose storage lockers.